Hello friends! I hope you're ready for some fun. You've heard of the Traveling Totes right? If not, here is how the Traveling Tote series began, read about it HERE, and HERE is the first post. Our next traveling tote post is on March 1st and we have a great giveaway to offer so mark your calendar. We're doing something different for this post. 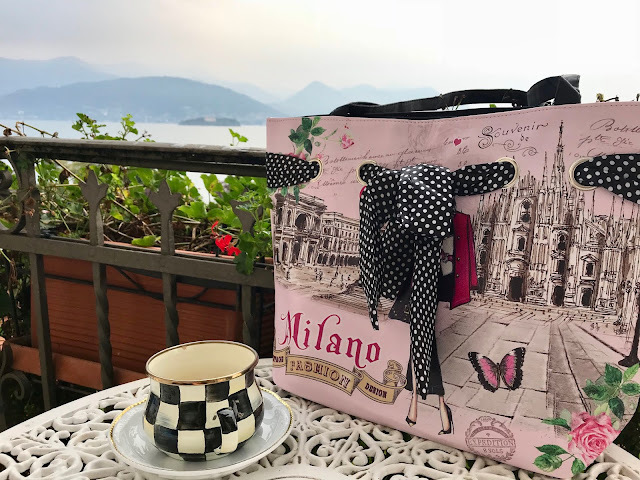 Where in the world is my MacKenzie-Childs mug? I travel with my hearty and handy handsome Courtly Check enamel mug which is perfect for a draught of hot chocolate or calming tea. Dressed up and styled out, it’s black and white. Very classy—with a kick. Joe is usually the photographer, but I have asked others to take my picture. Hope you enjoy the mug photos and maybe you can guess where I was. Do you have any trips planned for 2019? I enjoy living vicariously through others. Feel free to guess where I was in the photos. We are now buried in snow, and I love looking back to these warmer days sipping coffee with my dearly beloved. We are closer to spring now than we were in September right? I have a lovely sunflower towel to give away, and all you need to do is leave a comment. I will pick a winner on February 14th. Feel free to visit any of the traveling tote blogs listed below. They would love that. Thank you for stopping by, and I'll be back on February 14th to announce the winner and share some "love"ly photos. Good morning! I have loved all things McK.-C. for many years. 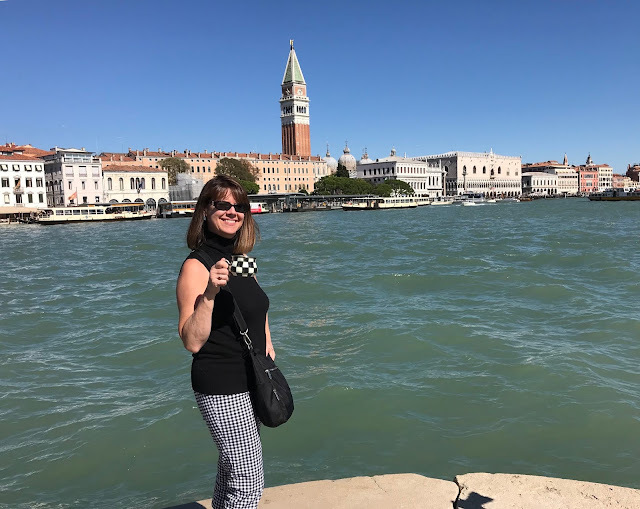 I think you were visiting Venice in Sept. and would love to win that beautiful towel! What a terrifically fun post, Debbie. I am envious of all my tribe's travels while I am buried beneath boxes. Such a very clever idea, traveling with the mug. No matter where you go, the MKC is recognizably chic! 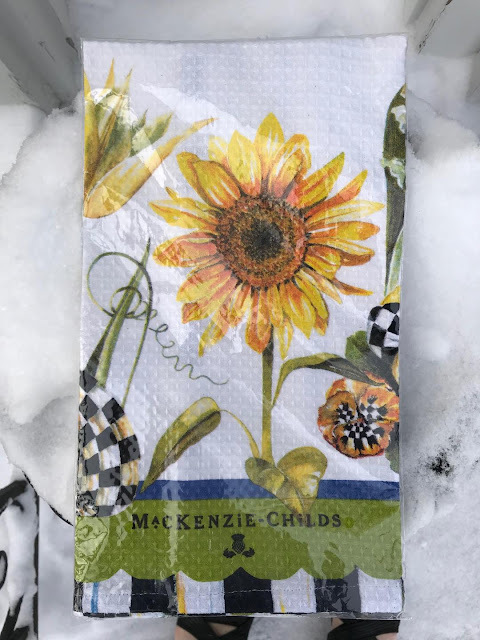 Deb, You are definitely a model for MacKenzie-Childs! 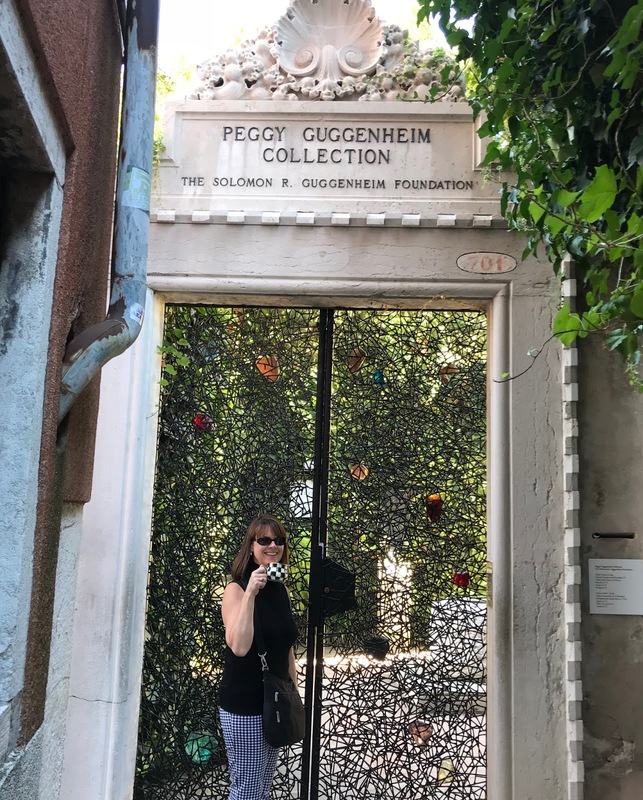 I always love your photos, whether they are in Italy, maybe Venice and Milan or maybe your camp house! It's funny how our cups make everything taste so good! Hugs sweet friend. Cute photos.....Looks like you both had a great travel! As always, you look adorable in your "mug" shots! I know that in some pictures you were in Italy, and in others, New York. Wherever you go, I enjoy "traveling" with you. Thank you Kitty! You are correct, I was in Italy and New York. You are the winner of the towel. Enjoy! 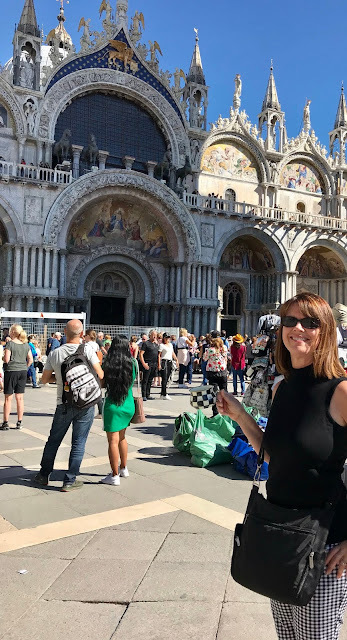 I love virtual travels too Debbie, and your trip to Italy was just dreamy! 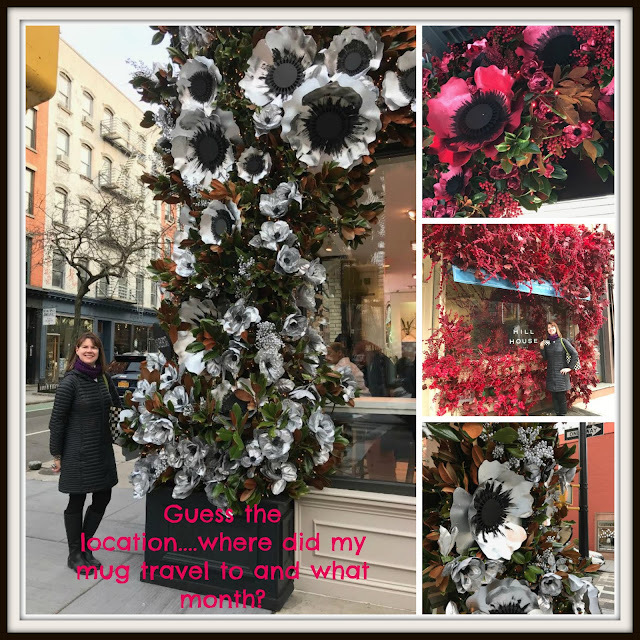 I loved the NYC outing too, that shop with the crazy flowers all over it is quite something! Great photos! Cute tea towel, how nice of you to do a giveaway! Lovely post Debbie. You look so cute in all of your travels. A dreamy vacation to italy, New York or staying at your camp house. How fun to be able to see your travels, especially with your MKC pieces. Have a wonderful weekend. Susan, yes we were in Milan, Venice and the Adirondacks (girls weekend in Wilmington). All in September 2018. Deb, I'm thrilled that you and Joe have the travel bug. Travel is a rewarding lifestyle and you two are doing it right, I'm eager for youto experience France this spring! Great post, my friend. Dtay warm!!! Oh that lucky mug has been everywhere. I love that you have darling clothes to go along with the Courtlt Check in Italy and New York and camp. I need to up my game and find some clothes- haha. Good luck to the winner. My fist guess is Venice! But what I love most aside from your travels is how you're perfectly coordinated (sartorially speaking) with your mug. I love your photos!